Many plant species respond to climate change by phenological shifts, usually with an earlier flowering onset. However, the variability in flowering responses to changed climatic conditions is large, and rare plant species, which are likely to have a low environmental tolerance, may be less able to shift their phenology than common ones. If plant species respond to climate change by shifting their flowering phenology, plant–pollinator interactions may become disrupted. However, it is vital for the reproduction of animal-pollinated plants, and thus for long-term population survival, that plants can attract pollinators. This might be especially difficult for rare species as they may depend on one or few pollinator species. 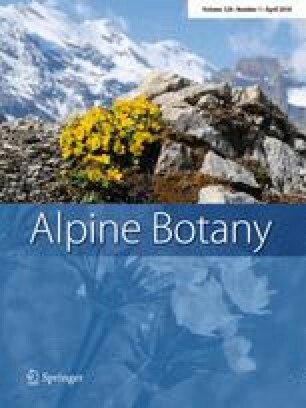 To assess how climatic conditions affect the phenology of common and rare plant species, and whether the plant species attract potential pollinators, we assessed flowering onset and flower visitation in the lowland Botanical Garden of Bern, Switzerland, for 185 native plant species originating from different altitudinal zones. Plants from high elevations flowered earlier and showed more pronounced phenological shifts than plants from lower elevations, independent of species rarity. The probability, number, and duration of flower visits and the number of flower-visitor groups were independent of the altitudinal zone of plant origin and of species rarity. The composition of flower-visitor groups did also not depend on the altitudinal zone of plant origin and on species rarity. Thus, rare and common alpine plants may generally respond to climate change by an earlier flowering onset, and may be able to establish novel interactions with pollinators. The online version of this article ( https://doi.org/10.1007/s00035-018-0201-x) contains supplementary material, which is available to authorized users. We thank all volunteers who helped with the data collection; the Botanical Garden of Bern for allowing the flower-visitor observations; Corina del Fabbro for statistical advice; Andreas Ensslin and Steffen Boch for helpful comments on the manuscript. M. R. thanks the German Research Foundation DFG for funding (RA 3009/1–1).